Osaka, Japan – Group A Streptococcus (GAS), sometimes known as "flesh-eating bacteria," causes invasive infections that result in high mortality. GAS is susceptible to many antibiotics, but continues to cause devastating infections. Many studies have attempted to understand the mechanism for immune recognition of GAS; none has provided a clear explanation, until now. In a new study published in the Proceedings of the National Academy of Sciences of the United States of America (PNAS) , an international research team led by experts from Osaka University investigated a variety of genes activated by the inflammatory components of GAS cells. They found that macrophage inducible C-type lectin (Mincle), an innate immune receptor, was strongly activated by exposure to these components. GAS is a Gram-positive bacterial pathogen that can cause severe invasive infections, such as streptococcal toxic shock syndrome, necrotizing fasciitis, and bacteremia. Although GAS is sensitive to antibiotics, these infections continue to be associated with high mortality. In the study, the research team clarified the mechanism by which invasive GAS evades the host immune response. This understanding is essential for improving treatment of infections caused by this pathogen. "We found that GAS produces a glycolipid, 'DGDG', which inhibits the immune receptor activity of Mincle," says Sho Yamasaki, corresponding author on the study. "We suspect that this inhibition contributes to immune evasion by GAS." In the study, DGDG inhibited activation of Mincle by other GAS proteins in an in vitro assay. In a mouse model of GAS infection, mice without the Mincle receptor showed higher rates of mortality, suggesting that this receptor plays a critical role in the immune response to GAS. "Our results suggest that blockade of DGDG production by GAS may provide a therapeutic option by increasing the ability of Mincle to initiate antibacterial immunity against invasive GAS," says Takashi Imai, lead author on the study. "We expect that antibacterial drugs can be made to target the enzymes responsible for producing DGDG." In addition to providing a potential drug target, this increased understanding of the immune evasion mechanism is likely to guide new and improved treatment methods and strategies for combating GAS infection, including potential ligands for inclusion in vaccines against the bacteria. GAS is a bacterial pathogen that can cause severe invasive infections associated with high mortality. 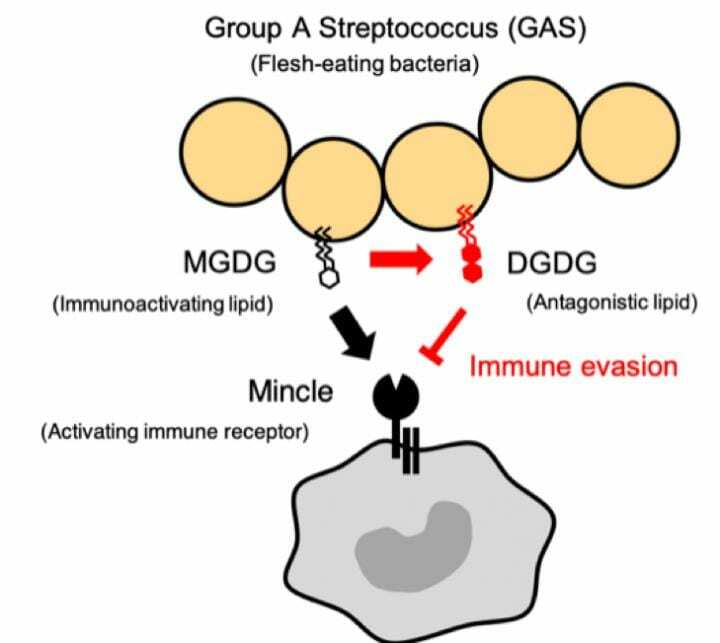 This study clarified the mechanism by which invasive GAS evades the host immune response, and provided critical guidance for new curative and preventive therapies for GAS infections. The article, "Lipoteichoic acid anchor triggers Mincle to drive protective immunity against invasive group A Streptococcus infection," was published in PNAS at DOI: https://doi.org/10.1073/pnas.1809100115.